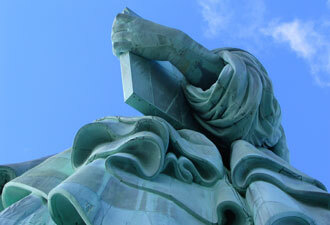 Many of us make New Year's resolutions this time each year, so why not resolve to visit our nation's “First Lady of Liberty,” the Statue of Liberty, in 2012? 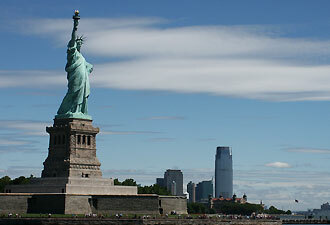 Your trip to Liberty Island begins with a ferry ride across New York Harbor. Leave the hustle and bustle of New York City behind, and in no time the drone of honking horns is replaced by sounds of waves lapping at the bow of the boat and sea gulls overhead. Astounding views of the city as seen from New York Harbor emerge. Minutes later, the ferry glides past the haunting historic structures on Ellis Island where over 12 million immigrants entered this country in pursuit of the American dream. Impressive from the shores of Manhattan or New Jersey, Lady Liberty becomes even more “monumental” as you approach Liberty Island. “She doesn't look too bad for a 125 year old!” and “She's even bigger than I thought!” and then, “Mom, why is she green?” The questions start even before the ferry arrives at the dock. Ranger guided and audio interpretive tours help answer even the most challenging of your queries. Upgrades to the interior of the monument's base and to the historic fort that provides its foundation are underway. Stairwells, elevators, and mechanical systems are all getting a makeover. The down side is that the interior of the statue — including the museum, pedestal, and crown — are closed to the public while the work takes place. The upside is that you get to see history in the making. Although the crown is temporarily off limits, you can still get a world-class view from the top, thanks to five new torchcams installed in honor of her 125th anniversary. You can download a free app to get a bird's eye perspective that only one “Lady” (and a few National Park Service employees who maintain the torch) had in the past. One camera is pointed toward visitors, so smile, your Aunt Myrtle in Florida may be watching! The transformation of the Statue of Liberty into a symbol of American immigration is a striking story, one that emphasizes American freedom and opportunity as key meanings of the statue. So why not add learning about that story as another resolution for 2012? 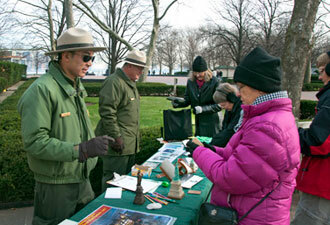 A short detour to Ellis Island on the way home can unearth a treasure trove of America's and your own family's history. The new Peopling of America© Center, a major expansion of the Ellis Island Immigration Museum, explores arrivals from the Colonial era to the 1892 opening of Ellis Island.